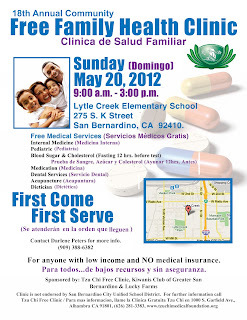 We provided oral examinations, oral hygiene instructions, and gift bags for over 72 kids from the ages of 2-5 years old. What I found interesting was that although a few number of kids needed proper oral hygiene instructions, I found no children with existing carious lesions. It was a far cry from 1999-200 when I was volunteering at the USC Mobile Clinic; back then with those kids over 75% were in need of immediate dental work. Monrovia was obviously a much more affluent area than the cities that we visited with the USC Mobile Clinic. It's days like these that remind me the stark differences in oral health between the impoverished areas and the more economically developed cities. While some of the reasons are a result of access to care, I believe the majority are the results of financial constraints. 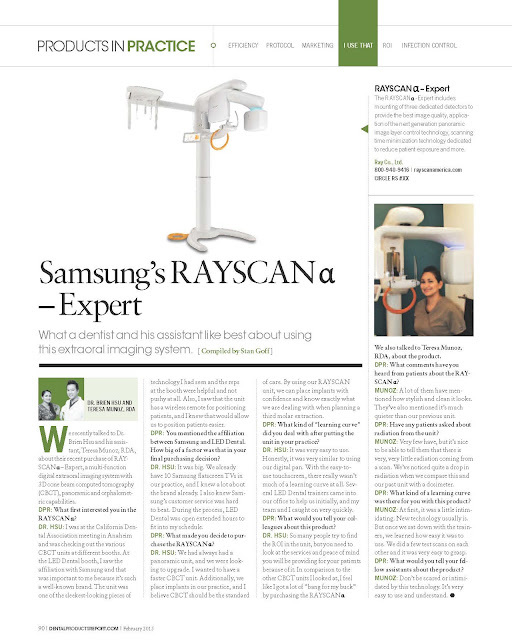 Recent advances in technology has allowed many dentists to apply 3D Cone Beam CT imaging to patient care in private practice. I took the plunge late in 2014, investing in one of the top rated 3D Cone Beam CT scanners in order to improve the quality of dental care for my patients. While most hospitals will charge around $1000 for a single scan, we charge only a small fraction of that cost. Less than one percent of the dentists in the world have this technology - in fact none of my current fellow cosmetic and general dental colleagues in my known network have one of these machines (as of November 2015). I'm sure most dentists may think it highly impractical to allocate such a large monetary sum towards technology that will not give an immediate return on investment. However in my humble opinion, the peace of mind that I am providing the best dental care for all my patients outweighs any monetary reward. 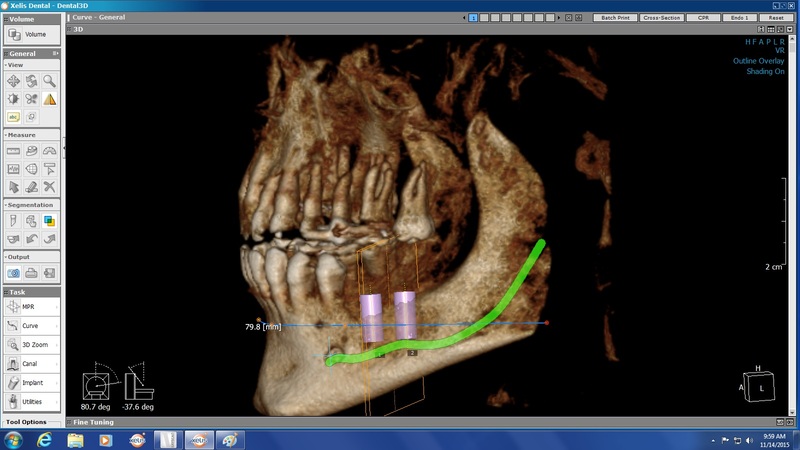 I have been very impressed with the accuracy of our imaging technology thus far. 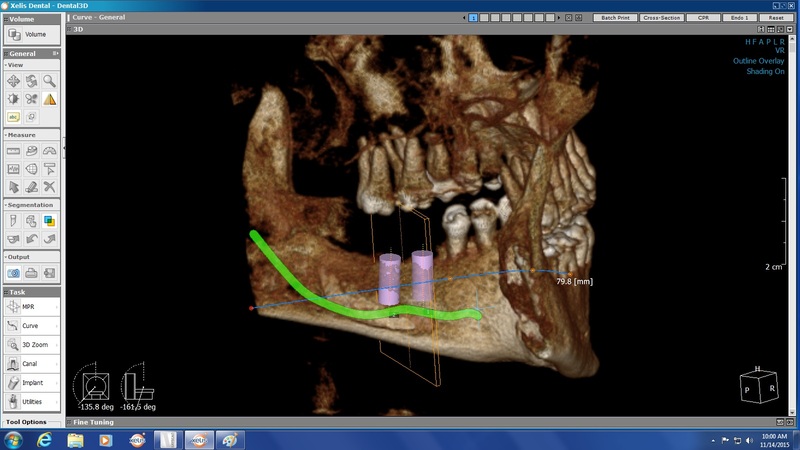 Below is a sample case of one of the methods of how we utilize our 3D Cone Beam CT in our practice. In these images we are maximizing both the length and diameter of each implant, thereby improving the retention and therefore the longevity of the implant. Please note the close proximity to the IA and mental nerve. Without this technology, many dentists may run the risk of damaging a nerve when placing implants of this size. 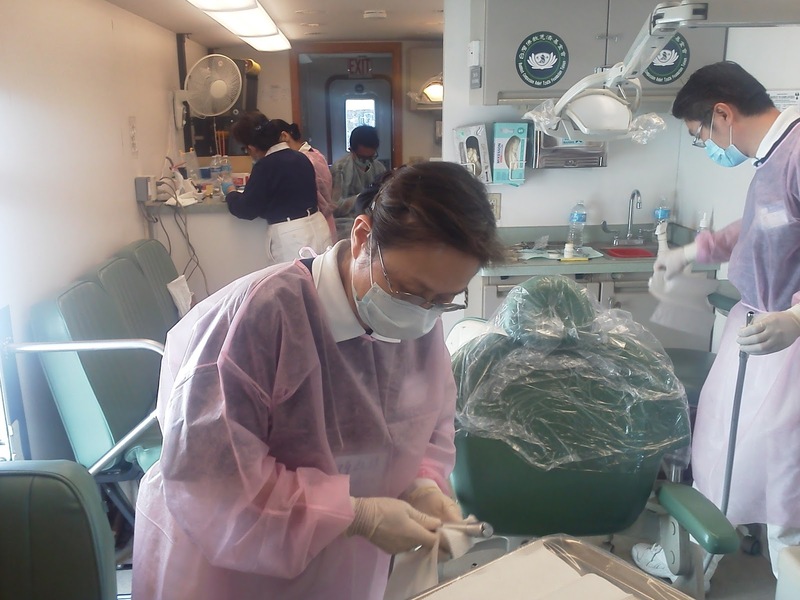 The following month I was contacted by the director of the Tzu Chi Medical Foundation about their very first free medical and dental clinic in Orange County. 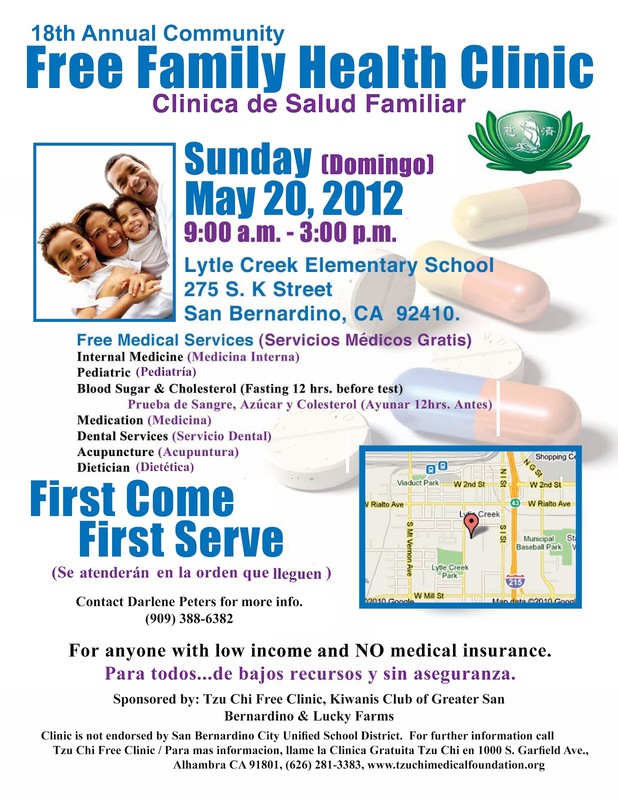 This organization has been operating various mobile clinics throughout Southern California and Mexico for over a decade. I immediately made arrangements so that I would be able to volunteer and donate my services. Upon arrival on 8/25/2013 in Santa Ana, I noticed that while there were a lot of patients in the waiting area, the numbers were not anywhere near what I am used to experiencing in the free clinics in San Bernardino and Mexico. Perhaps the population in Orange County were not as financially strapped and therefore did not need as many of these free services? I was immediately ushered into the mobile unit and assigned to perform surgical extractions and fillings. What I felt was nice, was that they assigned 1-2 assistants to help me with my dental surgeries. 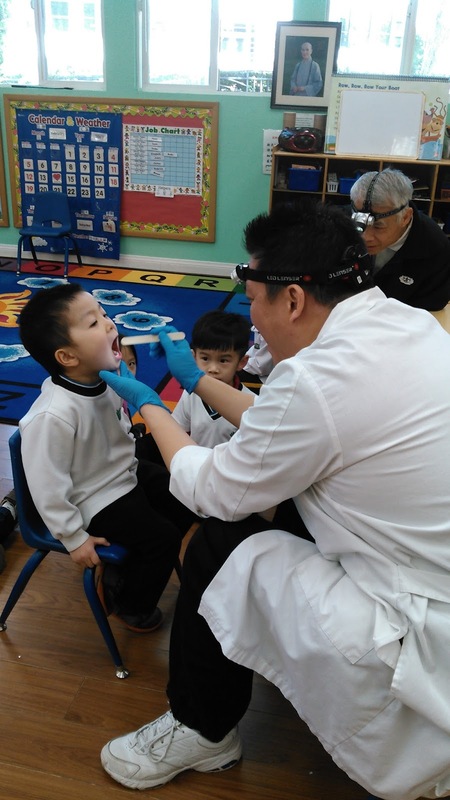 Normally the doctors at free clinics receive 0 - 1 assistants - so this was a pleasant surprise. These assistants were also volunteers - the lady in the photo is a retired molecular biologist, while the gentleman was an engineer. Because this was Tzu Chi's very first free clinic in Orange County, it took the organization almost an hour before we were able to see patients. Therefore we started around 10 am and ended at 2:30 pm. Even though the duration of this free clinic was shortened, I was still able to see about 12 patients, all with procedures such as scaling and root planning, fillings and surgical extractions. In general, I did notice that the oral health of patients here in Santa Ana were definitely in better condition than that of the patients in the San Bernardino and LA counties. However regardless of the conditions of their teeth, all these patients were in need of dental work, and all of them were very grateful that we provided them with our services. Robbers, Free Clinics and a better Economy? Recently we had a break-in at our construction site for our new facility. The burglars basically stole some materials and cut out copper piping, medical gas piping and electrical wiring in the building. When we reported the crime to the Rancho Cucamonga Sheriffs Dept, we found out that these incidents have been very common especially during these times. It's frustrating because the amount of money the thieves made from selling the copper and metal was nothing compared to the repairs we would have to do for our office. Luckily my partners and I have insurance and most of the damages should be covered... It just puts yet another delay on our anticipated move date. FYI : for those patients who are not aware yet, we are moving to a new dental office in the same shopping center in the next few months. I was shocked the lines were short and the work needed by many of the patients were quite minor. I saw about 16 patients and was done early in the afternoon. When I left that day, I felt great - not only because I was able to help people who cannot afford dental care, but the place being less packed translated into what I believe is a sign that the economy is getting better...which means all my patients who have suffered losses the past few years may finally be seeing the light at the end of the dark financial tunnel! In the month of October 2011, a colleague and I visited the American Dental Association Convention in Las Vegas at Mandalay Bay. It never ceases to amaze me as to how may dentists and auxiliary staff attend these annual sessions. Every year the ADA rotates the site for this convention – and this year it happens to land in Las Vegas. 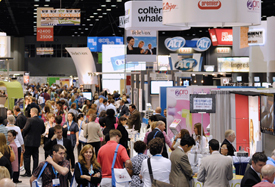 The typical set up of these large annual meetings are the first floor containing exhibits on new dental technology and materials and on the floors above, classes are held for dental related continuing education. This year there must have been over forty thousand attendees … perhaps many of them here because they wanted to gamble afterwards? In total I spent 2 days at this convention – which I felt was not enough. Visiting the many booths help me upgrade all my necessary dental materials such as my dental composite materials and prepared me with a list of many other dental upgrades to come in our new office that was currently under construction. The classes I took up on the 2nd and 3rd floor, as always, were helpful in broadening and improving my knowledge on my dental surgery skills and education.